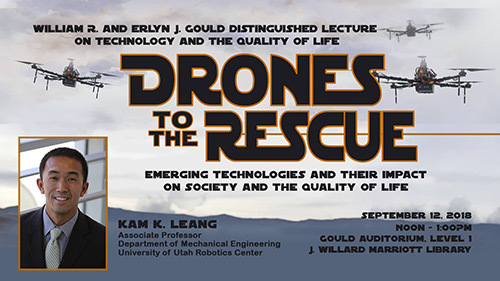 University of Utah mechanical engineering associate professor Kam Leang talked about the impact drones are having on society and industry for this year’s William R. and Erlyn J. Gould Distinguished Lecture on Technology and The Quality of Life. The lecture, “Drones to the Rescue,” was held at noon on Sept. 12 in the Gould Auditorium, level 1, in the J. Willard Marriott Library. Over the last decade, drone technology has advanced significantly, due in part to innovations in small mobile devices including cell phones, tablets, and other personal electronics. Drones are now smaller, faster, and less expensive, and this trend is likely to continue. Although the term ‘drones’ has a negative connotation in many minds, the rapid increase in potential high-impact and game-changing non-military applications has attracted significant attention from the average do-it-yourselfer to tech giants that see the technology as disruptive. This talk will summarize the key emerging applications for consumer drones, including drone-assisted emergency response and environmental monitoring, and it will highlight some of the challenges ahead and the technology’s impact on society and the quality of life. The William R. and Erlyn J. Gould Distinguished Lecture on Technology and the Quality of Life was inaugurated October 7, 1992, at the University of Utah Marriott Library. In establishing the lecture series, Bill and Erlyn Gould both recognized the critical need for continuing public education about issues regarding modern technology and its impact on our daily lives. Inherent to the advantage of technology is the importance of understanding the ramifications and responsibilities that accompany modern scientific discovery. Only through continuing public education can scientific fact and social philosophy be successfully merged. The lecture series is intended to provide a forum for the discussion of problems, issues, experiences, and successful case histories of the regeneration and preservation of our communities through the application of modern technology. It is hoped that an increased awareness of obligation in the public trust will emerge among practitioners of technology as they address the very important environmental and life-deteriorating problems facing society today. Through interaction between technologists and opinion leaders in communities that are the benefactors of their efforts, a synergism can develop through which society may see great benefit in the long-term future. With the lecture series, it is intended that a dialogue be opened between the technologist, the philosopher, the humanist, the private citizen, and all who may wish to assert an active voice in our collective future. In such an atmosphere of mutual interest and understanding, no one group will be singled out for exclusion or blame for society’s ills; rather, through understanding, discourse, and public education the positive direction of our future may be shaped. The Marriott Library’s mission is to provide information in all formats sufficient to support the scholarship, teaching, and research programs of the University of Utah to its students and faculty, and to the citizens of the state. In this light, the annual lecture will strive toward providing a greater public understanding of technology and the social potential that can be cultivated. In conjunction with the Utah Science, Engineering, and Medical Archives program of the Marriott Library, the lecture series will provide the means of bridging the many disciplines of technology while meeting the needs of the public in understanding its rich and diverse technological heritage.